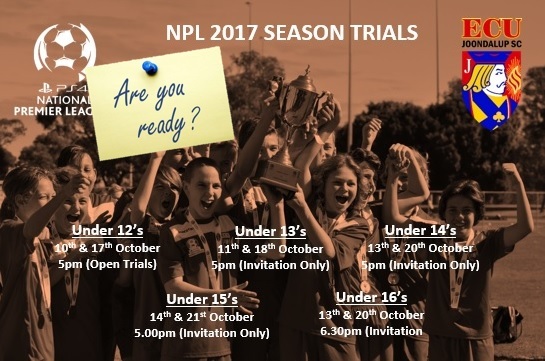 ECU Joondalup Junior NPL Trials – Are you ready!! ECU Joondalup Soccer Club 2017 PS4NPLWA season trials. Are you Ready!!!!!! TRIALS TO BE HELD AT ECU JOONDALUP FOOTBALL STADIUM – PLEASE ENSURE YOU ARRIVE 15 MINUTES BEFORE TRIAL START TIME TO CONFIRM REGISTRATION – PLEASE WEAR FOOTBALL APPROPRIATE APPAREL AND SHIN PADS ARE COMPULSORY.